Zone 1: Right back position. Zone 2: Right front position. Zone 3: Middle front position. Zone 4: Left front position. Zone 5: Left back position. Zone 6: Middle back position. 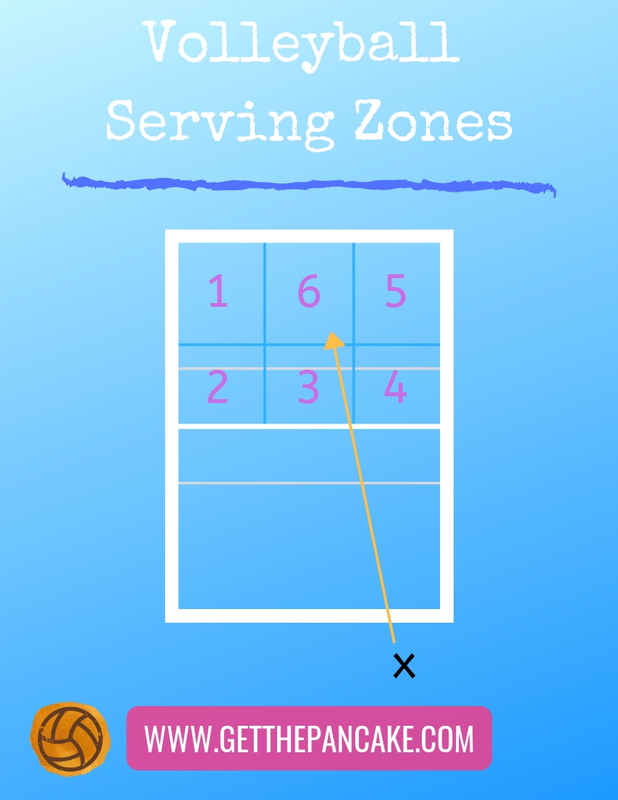 Players who are ready to start aiming for zones on the court can begin the task of developing serving accuracy by turning their body so that they are facing the zone they wish to serve to. We don’t need to be sneaky here! We want out body facing the zone we want to hit. Assuming we follow the correct steps for a successful serve (click here for a description of how to fix an overhand serve, or here for the 4 steps to serve a volleyball underhand), the only factor which would change the zone we serve to is strength of serve. Once your players have the zones figured out, you want to be able to tell them to serve to a zone in a match. Watch any high level volleyball match and you will see a member of the coaching staff holding up their hand with a clipboard blocking their signal from view of the opposing team. This is when they are signaling zones to their server. This has traditionally been shown to servers by holding up a fist. Make sure you have your players memorize the zones (and signals) before your match… The worst is when you show them a “4” and they point and count aloud as they look around the court “one, two, three, FOUR!” or when they say, “What does that mean again?” (cough, cough, SIX!). Depending on the age and level you’re coaching at, certain zones are better to serve to than others. In fact, there are more “zones” you can have your players aim at, too!